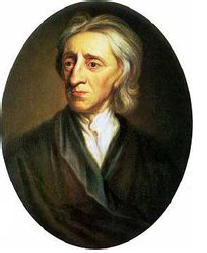 John Locke (1632–1704) was an English philosopher, often classified as an ‘empiricist’, because he believed that knowledge was founded in empirical observation and experience. [M]en have in their minds several ideas, such as are those expressed by the words whiteness, hardness, sweetness, thinking, motion, man, elephant, army, drunkenness, and others: it is in the first place then to be inquired, How he comes by them? All ideas come from sensation or reflection. Let us then suppose the mind to be, as we say, white paper, void of all characters, without any ideas: How comes it to be furnished? Whence comes it by that vast store which the busy and boundless fancy of man has painted on it with an almost endless variety? Whence has it all the materials of reason and knowledge? To this I answer, in one word, from EXPERIENCE. In that all our knowledge is founded; and from that it ultimately derives itself. Our observation employed either, about external sensible objects, or about the internal operations of our minds perceived and reflected on by ourselves, is that which supplies our understandings with all the materials of thinking. These two are the fountains of knowledge, from whence all the ideas we have, or can naturally have, do spring. The objects of sensation one source of ideas. First, our Senses, conversant about particular sensible objects, do convey into the mind several distinct perceptions of things, according to those various ways wherein those objects do affect them. And thus we come by those ideas we have of yellow, white, heat, cold, soft, hard, bitter, sweet, and all those which we call sensible qualities; which when I say the senses convey into the mind, I mean, they from external objects convey into the mind what produces there those perceptions. This great source of most of the ideas we have, depending wholly upon our senses, and derived by them to the understanding, I call SENSATION. The operations of our minds, the other source of them. In time the mind comes to reflect on its own operations about the ideas got by sensation, and thereby stores itself with a new set of ideas, which I call ideas of reflection. These are the impressions that are made on our senses by outward objects that are extrinsical to the mind; and its own operations, proceeding from powers intrinsical and proper to itself, which, when reflected on by itself, become also objects of its contemplation … Thus the first capacity of human intellect is that the mind is fitted to receive the impressions made on it; either through the senses by outward objects, or by its own operations when it reflects on them. This is the first step a man makes towards the discovery of anything, and the groundwork whereon to build all those notions which ever he shall have naturally in this world. All those sublime thoughts which tower above the clouds, and reach as high as heaven itself, take their rise and footing here: in all that great extent wherein the mind wanders, in those remote speculations it may seem to be elevated with, it stirs not one jot beyond those ideas which sense or reflection have offered for its contemplation.